Hi! And thank you for visiting! 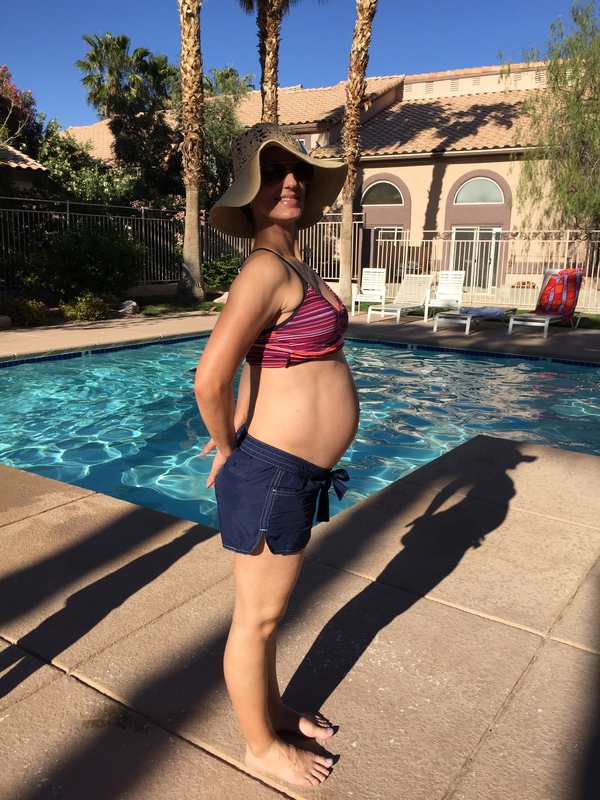 The following is a post I wrote back in May of 2015 during the 3rd trimester of my pregnancy, so it is written in first person. Leave a comment! We love hearing from you! I have always been a skinny girl. most likely implying they hate that I don’t gain weight and that they do. 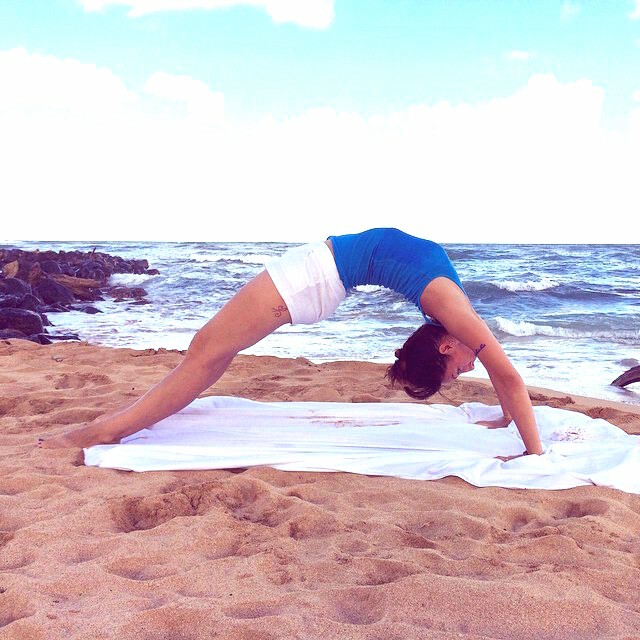 Me (Alison Marsh) Kauai, Hawaii September 2014 2 months before I got pregnant. I was always insecure about being thin; having very little womanly flesh on me. So I am gladly embracing this hip and rib-cage widening that is going on, and my flat, muscley stomach that is now protruding from my belly (please don’t hate me). I feel like a woman! I am blessed to have the opportunity to grow a human inside my body! With the body expanding in all directions, naturally comes discomfort and major adjustments. I didn’t expect how my body would gain weight and expand so quickly, and how I would have to adjust. Me at 26 weeks, 145 lbs. I remember having to work harder to move. Going up the stairs to the second floor in our house was much more challenging on my legs, and I would lose my breath easily. Because of the laxity in my joints and ligaments, particularly in the pelvis, I had to work harder at keeping my pelvic floor and protruding abdominals engaged and lifted. Also, fatigue is common in the first trimester, due to the immense changes happening in the body in preparation to house a fetus for 9 months. All of these major changes are preparing the pregnant body for the marathon of labor and child-birth, also termed “D-Day” for delivery day. I am beginning my 7th month now and weigh about 145lb., having gained 20lbs total since becoming pregnant. Every time I gain, my body feels it, and I have to readjust – working harder than before, yet, becoming stronger than ever! No one has looked at whether muscle mass or muscle function (the force and velocity of contraction) changes during pregnancy. However, several observations suggest that both muscle mass and strength increase. First, in the only study which it has been measure, lean body mass after pregnancy was about five percent greater than before pregnancy (Little, Clapp, and Ridzon 1995). As bone mineral is unchanged, the difference is probably due to an increase in muscle mass. Second, the fact that a woman carries around an additional 20 or more pounds during late pregnancy should increase muscle size and strength in the lower extremities. Weight gain in pregnancy = stronger muscles! Joints connect bone to bone with the support of ligaments. Most joints allow our bodies to move freely: knee joints, hip joints, shoulder joints. But some joints provide limited movement such as the SI Joint and the Pubic Symphysis Joint, which are further supported by ligaments. Ligaments connect from bone to bone in order to form and support a joint, often deriving from the outer layer of the joint capsule. Ligaments provide strength and stability to inhibit hyper-mobility of the joint. The pelvic area is covered in ligamentous tissue. Ligaments have an abundance of sensory nerve cells, making them capable of responding to movement and speed. This also makes them capable of sending pain signals to the brain. Yet, ligaments have very little blood supply, making them difficult to heal. Once a ligament is overstretched, it most likely will not return to its original supportive state – why it is important not to overstretch a pregnant woman. Click here to view a video on The Anatomy of the Pelvis by Nail A. Ebraheim, M.D. This is due to the rise in hormone levels, particularly progesterone and relaxin. Add weight to hyper-flexible joints and ligaments, and you get pain and discomfort, most likely caused by instability. Dr. James F. Clapp III. M.D., writer of Exercising Through Your Pregnancy, says that regular exercise should offset the effects of pregnancy on ligamentous laxity [loose joints], improve strength, maintain muscle tone, and reduce the incidence of low-back pain and other musculoskeletal complaints. The American Congress of Obstetricians and Gynecologists (ACOG) suggests 30 minutes of moderate exercise on most, if not all, days of the week for a healthy pregnancy. Click here for the ACOG’s FAQs about Exercise During Pregnancy. We are using a slightly deflated big ball to keep Rachel (our model) propped up –heart above the baby to prevent supine hypotensive syndrome-a condition that is caused by the weight of the uterus compressing the inferior vena cava vein when a pregnant woman lies on her back for long periods. Upside down jump board as a prop to keep heart above baby. You can also use a Jump Board in place of the ball. 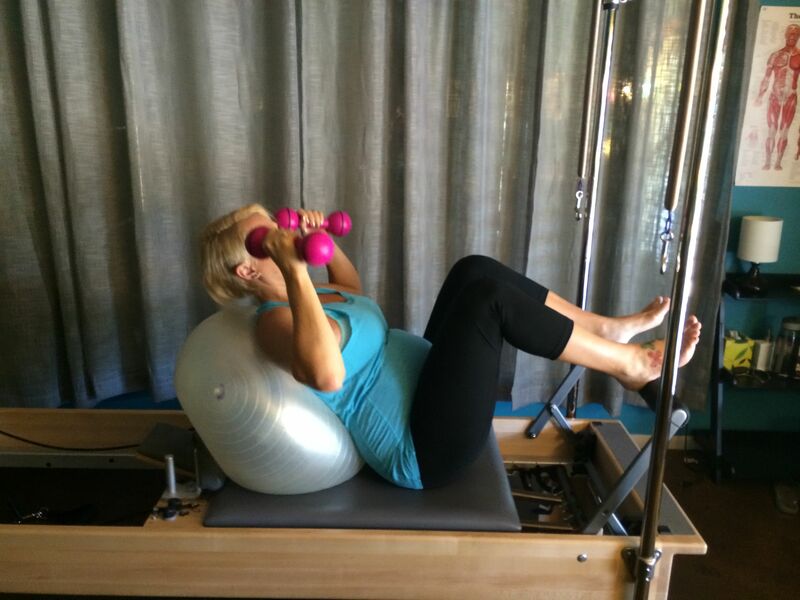 There are pregnancy Pilates bolsters made specifically for this purpose, but my pregnant clients and I havefound that a big ball or the jump board are much more comfortable and more efficient. Watch for too much extension (arching) in the low-back. Put a small pillow under the low-back if mom is having a hard time keeping neutral. Legs Wide – 3 Sets: Parallel, Turned Out, Turned In. Can also work on balls of the feet, and with legs under hips. Use 2-5 lb. weights, depending on strength. Engage Lattisimus dorsi muscles to keep upper trapezeus from overworking. Gaining strength in the lower limbs and core is crucial for taking on the demands of added weight as pregnancy progresses. Click here for Part 2 of The Beauty of Weight-Gain – positive body image during pregnancy. Thank You for investing your time to learn about pregnancy Pilates! Questions or Comments? Please Fill out the form at the end of this post. EXERCISING THROUGH YOUR PREGNANCY by James F. Clapp. Omaha, Nebraska. Addicus Books, Inc., 2002. THE PREGNANT BODY BOOK New York, New York. DK Publishing. 2011. Please visit my Resource Page for a growing list of informative videos, article, books, and websites. Also check out the links on the right side of this site.